The sun is finally out and you might be planning a vacation or you may have started a new job that requires you to be away from home for long periods of time. Whatever the reason may be, you may need a solution for your pet to get the love and care they need while you’re busy outside your home. Luckily, NOVA Pets Health Center has your back and can hold the leash until you return. From disruptions in our daily routine to planned escapes, life is full of events that may require us to consider alternative care options for our beloved pets. When you’re gone, your pet will still need fresh food, clean water, basic grooming, entertainment, and a lot of love and attention. But why is boarding such a good option? First, NOVA Pets in particular is able to look after not just dogs and cats, but also birds, reptiles, and many other exotic and small animals! This is especially beneficial for those who own multiple pets because your pets can be boarded together or receive optional play time sessions where they can visit with their brothers and sisters. Second, our employees are specifically trained to work with a variety of animals so you can be confident that you will be leaving your pet in good hands. It is important to take a tour of facilities you are considering boarding your pet with to ensure the cleanliness and safety that your pet will receive and if there is an on site veterinarian in case of emergencies. What are some other benefits of boarding your pet? One very important benefit is socialization! For pets like dogs, this is especially valuable as they easily become lonely without others around if they are use to constant stimulation with you and your family. 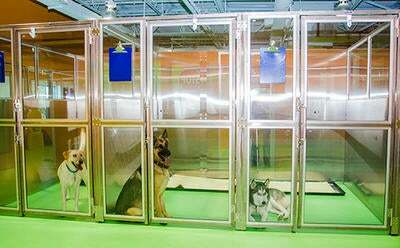 To safely facilitate this, NOVA Pets has plexiglass suites and runs for all dogs as well as supervised Doggie Day Camp and group play options! Felines also have a play area all their own so they can stretch out and have fun. NOVA Pets even offers extra available options that will enhance your pet’s stay! Those options include special treats, brushing, and even extra walks. Whether you’re boarding with NOVA Pets or not, you’ll need to take several things into consideration. You will need to ensure that the place you’re looking at accepts your species of pet. Then you’ll want to find out what accommodations are available for sleeping and for playtime. Ask what items you will need to bring with your pet too. For instance, NOVA Pets offers comfortable bedding and stimulating toys so you won’t need to bring any from home, but you must bring their food for the duration of their stay. Finally, be sure to ask about how the facility will communicate with you about your pet while you’re away. Will you receive updates by phone? Can you receive pictures of your pet if you’re away for a longer period of time? Pet boarding is available to decrease your stress but there are a few things you’ll want to ensure ahead of time so that there are no hiccups in your experience. For instance, your pet will need to be up to date on all required vaccinations It is also wise to look up facility reviews, as well as to solicit advice from friends and family on boarding places they trust. If you would like to board your pets with NOVA Pets you can find out more about pet boarding packages by clicking here!